Anytime I travel, I always get so many questions asking about my luggage. Anything from what I use, to if I like it, how it's held up, how much it holds, etc. 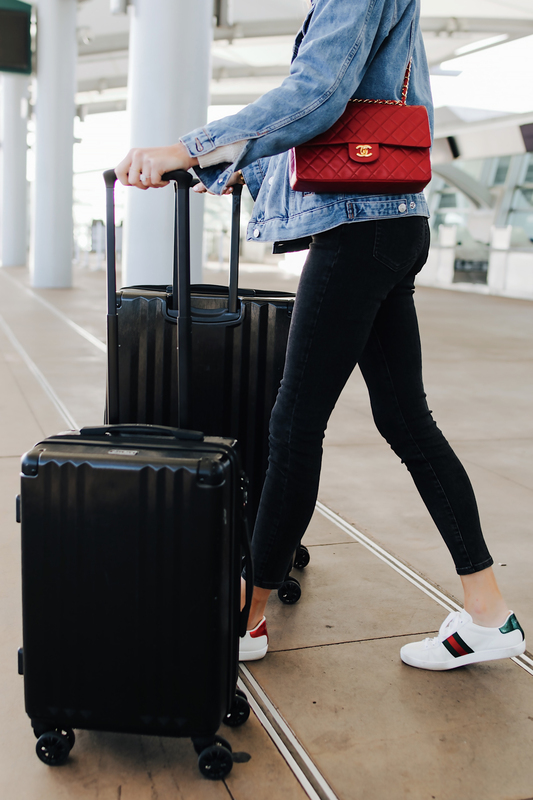 I wanted to finally share my review of the CALPAK Ambeur Luggage Set since I get so many questions and it's definitely a brand worth knowing/sharing. While I've only had the set since October 2018, it has quickly become my absolute favorite set of luggage I've ever owned. So much so, I purchased this CALPAK backpack (obsessed) and was also gifted this neck pillow (seriously the best I've tried). Keep reading for my honest review of the CALPAK Ambeur Luggage Set. The FAQs are at the end of the post. 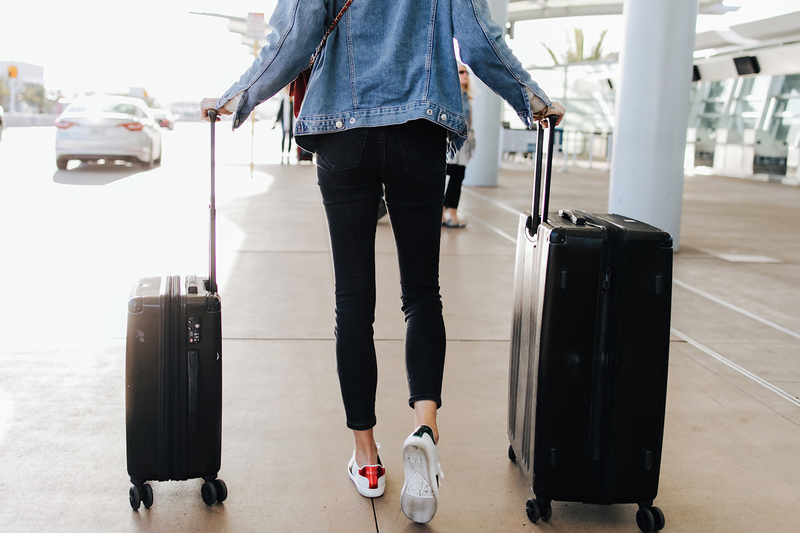 Rewind to January 2018, I was in the market for a new "grown up" set of luggage and had been lusting over Rimowa. Because of the amount of travel I do, I justified the price tag since I figured the Rimowa set would last a lifetime. I purchased a large suitcase and carry-on suitcase right before a ski trip. I was a little disappointed in how little the luggage held and how difficult it was to close when it was filled to the max. I told myself I would just have to get used to it. As soon as I arrived to my destination I noticed the suitcase was SO beat up, it even had a puncture! It did not look like the first use, more like the 100th. I was so annoyed. Any other time I use the Rimowa set I was extremely unsatisfied. I was planning a trip to London, and knew I was going to pack a lot, so I was dreading the thought of having to use the Rimowa set. I finally decided to try out the CALPAK luggage set that I had seen so many other people using. After packing for the London trip, I knew this was my new favorite set. There are a few online retailers (besides the CALPAK site), which carry the luggage. 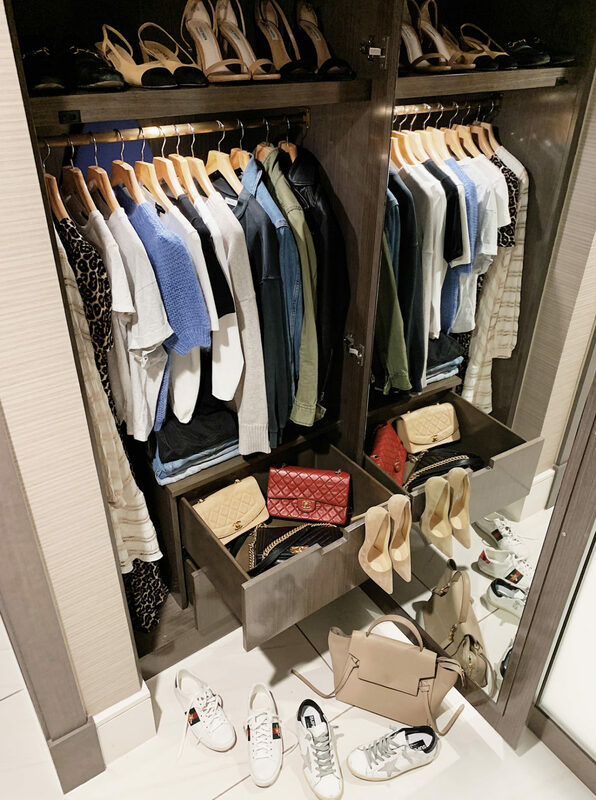 Nordstrom always has the best selection, Shopbop & Nordstrom Rack carry the line as well, and sometimes I can find a few pieces older pieces on Amazon. 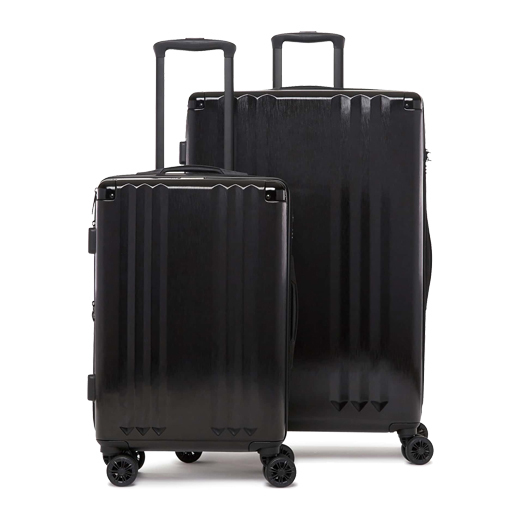 A lightweight hard shell provides durable, easy-to-maneuver utility in this sleek spinner suitcase set fitted with four multidirectional wheels for effortless airport navigation. The zippered divider creates two separate packing compartments, and an expansion sleeve unzips to increase the packing capacity. I really don't think I need to go into too much detail here. As I mentioned, this luggage set is my absolute favorite I've ever owned (I've had Samsonite & Rimowa most recently). When I first got my CALPAK luggage set, I was a little taken back by the exterior quality. I don't know what I was expecting, but I thought it would feel a little more sturdy. I was nervous to take it all the way from California to London and was unsure if it would hold up. Boy was I surprised. It still looked brand new coming off the conveyor belt (minus a few scratches to be expected). 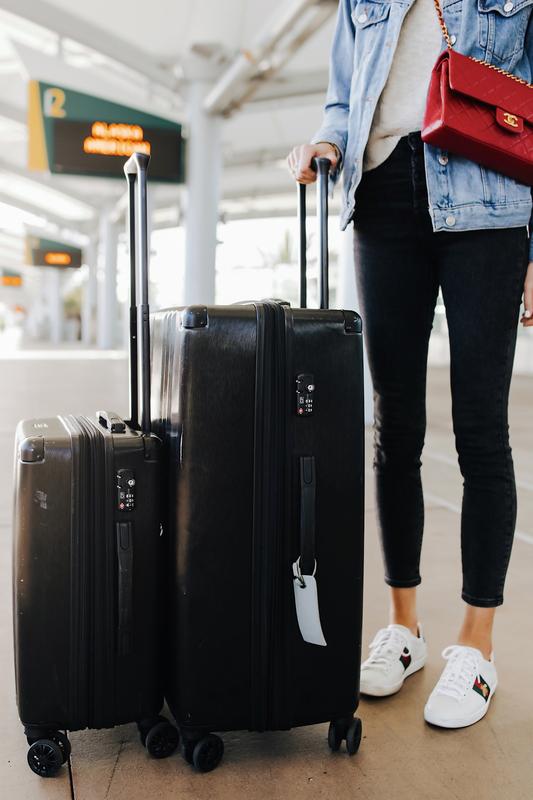 It's the easiest luggage to pack, and it holds SO much. When I went to London I took nearly 10 coats, a ton of sweaters, jeans, dresses, probably around 5 handbags, and at least 6 pairs of shoes. I still had room to bring home items I purchased. If you want to know more about what the luggage is made out, how it's manufactured, and its durability, watch this video and I dare you not to be sold after. I can't say exactly how much it holds, but I've never had a problem fitting everything, especially on 10+ day trips in the winter. Interior dimensions: Carry-On: 19” x 14” x 8.5” / Large: 27.5" x 19" x 5"
Do the handles get stuck? How well do the wheels roll? Does it come with packing cubes? Are there other styles to choose from? Been in the market for a new luggage set – so happy to hear such a positive review! And such cute colors! Thanks for the review! I’ve been on the lookout for a good traveling set since we keep on replacing ours almost every year. Love everything. I want everything you own hehe. Just so classic. Those luggages are so good too. Thank you for writing this in-depth blog. Looks like great luggage! Thank you for reviewing! Absolutely love this look and the luggage! So chic and helps you easily pull off that cool travel look! Love this! 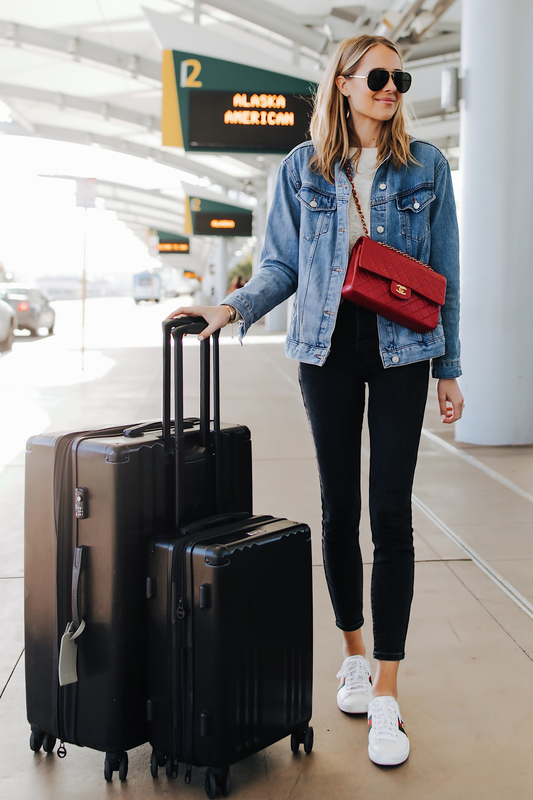 You are travel inspo goals! Thanks for this details review! 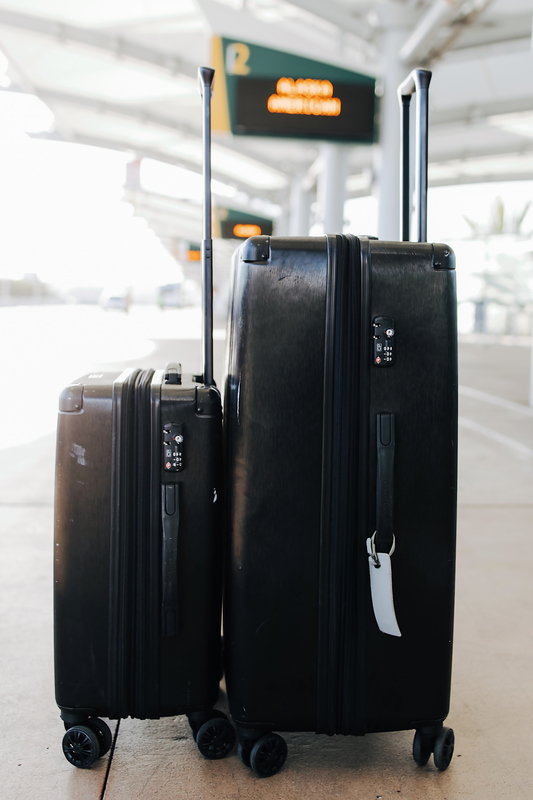 My fiance and I love to travel and on our most recent trip to Cartagena, Colombia, the handle for my larger suitcase broke and won’t raise anymore… Making it a nightmare to wheel around the bag. In the market for a replacement and your review is making me consider Calpak! Love the look of these bags and your blog!! Loving this luggage AND the price point! Traveling soon, might need to try this! 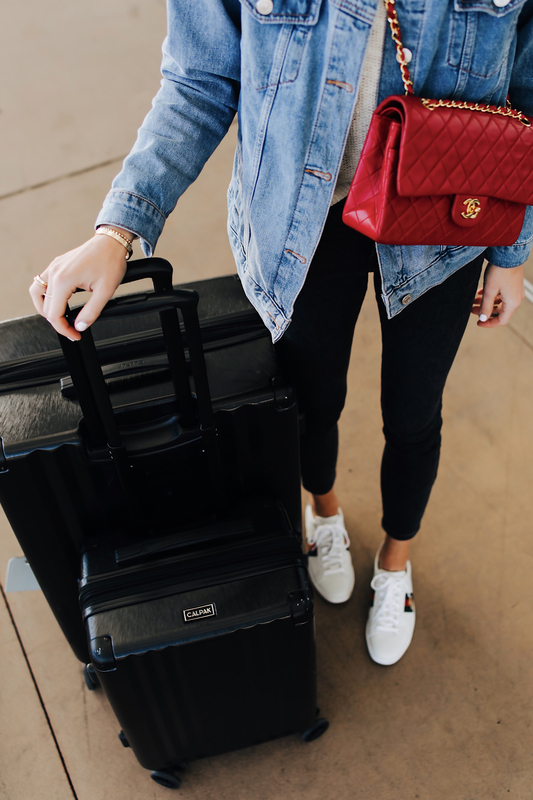 Love how affordable this luggage brand is! Thanks for recommending! Love Calpak and your style! Great review!! We need new luggage so badly but hate to spend a lot knowing they just get so beat up! Good to know that these are super durable!!! Love this post! I just got the backpack and had no idea they made luggage! Thanks for the review! Thank you so much for posting this! 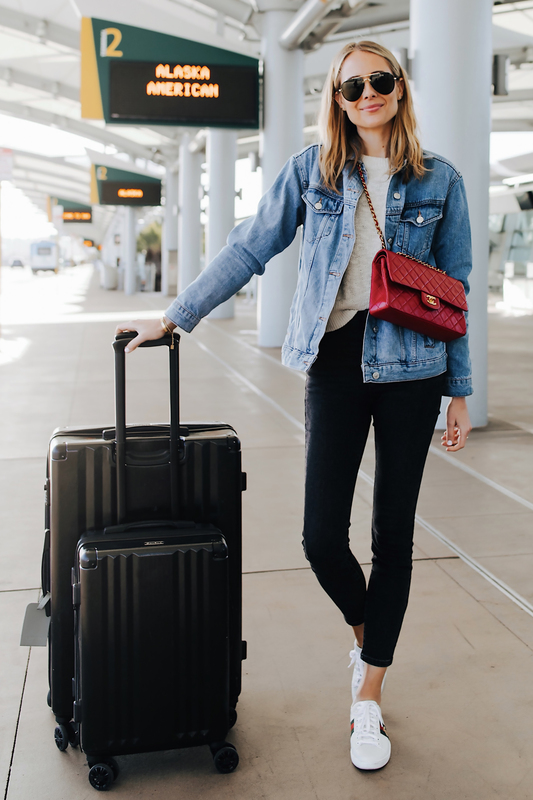 I have been looking for new luggage that is affordable/stylish and these pieces seem perfect! So cute and durable! Thanks for the post! Such a beautiful exterior and so reassuring to know that it’s not going to look super used and beat up after just a few flights!! Thanks so much for the review! Would love to own some “grown up” luggage! Southwest broke the handle off my carry-on 2 years ago and I still haven’t gotten around to replacing it! Found mine at Nordstrom Rack for $100 and I LOVE it. Very informative! I worry a little bit about the pre-packed weight of the larger one but love the durability of this luggage. How on earth can you go on a 10 day trip and stay under the required weight? I go away for 5 days and make my husband put some of my stuff in his bag Love your feed and all of your beautiful classic looks! Love them! So stylish and seem really comfortable for a long trip. Would love to try them!! Love thi luggage set! You have the best style! Love this outfit!! And have been looking into new luggage for an upcoming trip to Europe in July! Thanks for the insight on this luggage! I recently purchased my first Calpak piece: a travel hat box. The quality is amazing. Thank you for sharing your review of the luggage. Adding to my wishlist! I just recently got a calpak carry-on from Nordstrom Rack. I’ve only used it once but I love it! I would love some more calpak luggage for traveling! I’ve been eyeing the black TRNK set. Thanks for sharing your review! Have been lusting after the Calpak backpack (after reading your rave reviews). So cool to see they offer luggage as well. Would love to try it! My husband and I are finally taking our bucket list trip pre-attempting to have kids, and have been in the market forever trying to decide what suitcases to buy for functional travel that aren’t too big, but big enough. Thank you so much for such an in depth review, adding this to my Christmas list before our trip in late December, unless i happen to win a set 😉 Thanks again!! As someone who lives out of state for grad school, that luggage looks perfect for traveling home and around the country for interviews! I’ve never heard of Calpak. Thanks for the review. Definitely on my list of future luggage now. Thank you for the awesome review! I have been looking into buying a set and now I’m ready thanks to your post!!! Thanks so much for this review! I’ve had my eye on this brand of luggage for a while!! This was perfect timing for me as an airline broke my luggage last week and I’m going to have to get something new. Thanks for all of the information about the durability of these, as that is something I’ve learned to consider! I need a new carry on so badly! This one looks perfect! Need this luggage! Going on a trip to Spain next month and have to get my hands on a large suitcase before then so this would be awesome! Would love to win this awesome luggage! Love love love your travel style! And the luggage set looks amazing!! Thank you for posting this!! We’re in the market for a new set of luggage due to our current bag is down to three wheels and we have an upcoming honeymoon. It’s so hard to find an honest review of luggage that isn’t sponsored too so thank you!! Love your product reviews, always so so detailed & helpful! Your whole travel look is great! I’m dying to get those shoes. I just bought Veja’s so Gucci will have to wait a little longer! Im on the market for a new set and was between this and Away. Thank you so much for your honest review. Thank you for the information! Hope to try these soon! Thank you for this review! There are so many different Calpak luggages, it’s hard to know if there are any good ones or bad ones. I’ve always wondered if I should buy Calpak or Away….. These would be amazing for my upcoming trip to Punta Cana!! Love the 2-pc Calpak luggage set! Soo pretty and makes hog look good! Beautiful set, I love it so much! Yasss love Calpak! Could totally use this luggage on my trip to Uganda this summer! Love your style, instagram! And Bear+Scout of course! Love the luggage! Would love to travel with it! I have lots planned for 2019. I’ve been wanting to purchase Calpak! Recently got Delsey, but have heard such great things about Calpak! Thanks for Your reviews and explanation of this luggage! I am in major need of some new luggage!! Thanks for the review! I’ve been curious about this brand. Great info as always! Thanks for sharing. I’ve been dying to try this luggage set! Fingers crossed for the contest! Thank you so much for this review! I just got back from a 8 day trip to London (also in the cold) and so I felt like this spoke to me directly as I came back determined to find a better set of luggage! Thanks for this post Amy. I’m just looking for the right luggage. Thanks for sharing your honest opinion about the luggage. I am in the market for a hard shell luggage and this company always pops up on my Instagram! Obsessed with your travel looks!!! Love this! This luggage set looks amazing! So chic and trendy but also equally durable! I’ve been browsing for a more fashionable luggage set for a while but have not bit the bullet on any thus far due to their questionable ability to not get scuffed up during travel! This set seems to solve all my woes! Love this 2-piece Calpak Ambeur set. It’s a beauty! I love the honest feedback! I have been eyeing the Calpack luggage and just started traveling 3-4 days per week for work, so its super important that it’s durable and also fashionable. Love your style! Great, honest review. Sounds like a great set! Thanks for this review! I’m in need of some new luggage. I’ve looked at Calpak online before, but thought the price had to be too good to be true, for a good quality set. Thank you for your review! Perfect timing as I am currently shopping for new luggage! Really good review that help mw a lot, hope I win it!!! I’ve had my eye on a set like this and you’re review was great! Thanks for always being open and helpful! Would love to upgrade my travel luggge! Appreciate your post and details on the calpak! Love the info on the calpak luggage!